Culinary Chives are the most delicate member of the onion family and one of the finest herbs of French cuisine. Although delicate, chives herbs are hardy perennial herbs with a mild onion taste making it an essential culinary herb. The beautiful pink flower heads are a nice addition to salads and vinegar. Chives are a great addition to any garden setting. 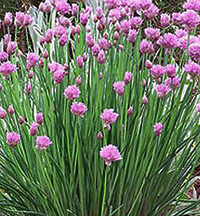 Plant chives in ordinary, well-drained soil. Snip and chop hollow green spears as needed. Chives grow to a height of 10 inches and can be spaced 15 inches apart. Ships in Large 4 inch pots. This is just the right size for transplanting. Please note: Cannot ship this plant variety to ID.